Credit: Photo by Nadia Whitehead / UA College of Medicine – Tucson. The best-known treatment for Parkinson's disease isn't perfect. Named levodopa, the drug can treat the stiffness and slowness of movement associated with the debilitating disease. "The problem is levodopa works great for a few years — we call that the 'honeymoon' period — but then you start getting these side effects," says Scott Sherman, MD, PhD, a neurologist at the University of Arizona College of Medicine – Tucson. Drs. 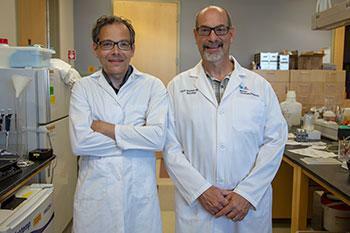 Sherman and Falk first got a glimpse of ketamine's potential in Parkinson's disease treatment more than five years ago. The two were using ketamine to relieve pain in five hospitalized patients with Parkinson's disease. The treatment worked as expected, but the researchers noticed an unintended side effect: the patients' uncontrolled movements while on levodopa were noticeably reduced. One patient experienced complete resolution of these movements for a period of several weeks. Intrigued, the researchers continued investigating and have since shown similar results in rodents with Parkinson's disease. "Disassociation is a sort of 'out-of-body' experience," Dr. Sherman explains. "When people describe it, they have told me that they feel like they are in fish bowl." "We are going to monitor blood pressure closely to make sure it doesn't get high," he says. "And we know at what dosage ketamine causes this disassociation; we expect that the dosage needed in Parkinson's disease will stay well below that level." Using 10 patients, this first clinical trial will verify that Dr. Sherman's hunch holds true — that ketamine is tolerable and effective for treating dyskinesia. "We want to find out exactly what ketamine is doing to have this effect," Dr. Sherman explains. If the team achieves positive results in both the human and rodent studies, Drs. Sherman and Falk will be one step closer to their goal: establishing that ketamine can help patients with Parkinson's disease. Dr. Sherman says, "Ketamine has been long overlooked. Now it could prove very useful for Parkinson's patients."